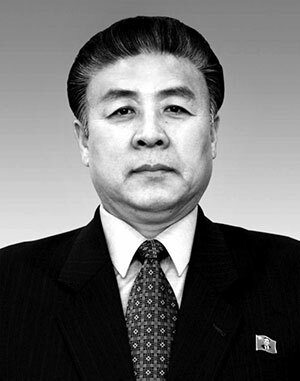 North Korean leader Kim Jong-un has sacked the governor of North Pyongan Province and replaced him with Mun Kyong-dok, a former Pyongyang mayor who was close to Kim's executed uncle Jang Song-taek. Kim Nung-o was fired as expected after Kim Jong-un complained about badly run factories in the province during a visit last weekend, but the apparent rehabilitation of Mun, who disappeared during the purge in early 2014 following Jang's execution, is a surprise. A former Unification Ministry official said, "It looks like a pro-Beijing official was selected in a hurry to prepare for increased economic cooperation with China." Jang was executed in 2013, apparently because he had amassed too much power by having business with China all sewn up, and because he was too close to the Chinese government. The official Rodong Sinmum daily said Wednesday that Kim sent gifts to Sinuiju citizens and workers at a cosmetics factory there, and identified Mun in the report as the head of the Workers Party's North Pyongan Province committee, which is the post equivalent to provincial governor. It was the first time Mun's name was mentioned in the state media since January 2014. Born in 1957, Mun grew close to Jang during the 1980s and 90s, his status rising as Jang expanded his power in 2010 during the final stage of Kim’s succession to the North Korean throne. When Jang went down, so did Mun, and North Korea watchers say it is amazing that he is even alive since hundreds of officials who had been close to Jang have either been executed or sent to political prison camps. Mun's ties to Vice Marshal Choe Ryong-hae, who is a powerful influence behind the throne, may have helped spare him the worst fate. A complex set of factors appear to be in play in Mun's rehabilitation. First, Kim Jong-un needed a pro-China technocrat to rebuild the border province, which was hit hard by international sanctions, and Mun is one of a handful left over after the purges and the long chill in relations with Beijing. One source said, "It looks like Kim is seeking to stimulate economic cooperation with China to rebuild the economy of North Pyongan Province." One researcher at a state-run think tank said, "Purging and then reinstating an official is a commonly used tactic" in the North. But Kim also appears to be sending a message to North Korea's elite that repenting for mistakes can lead to rehabilitation.